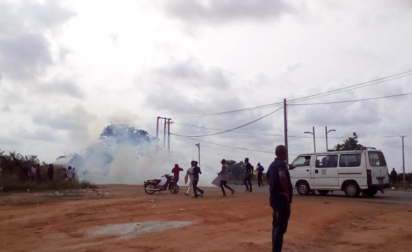 Protesting youths of Umuchima in Ihiagwa community, Owerri west local government area, of Imo state, Friday, scampered for safety after they were teargassed by Police officers. Also affected by the teargas were scores of Journalists, who were on ground to cover the demonstration. The drama started when the youths blocked entrance to the Federal University of Technology Owerri, FUTO. One of their reasons, was that the FUTO, management, has allegedly taken over the remaining part of their land called the water front.